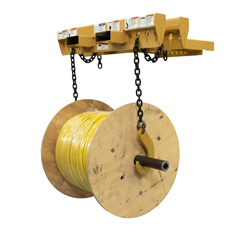 The BHS Overhead Reel Lifter (ORL) can be used for lifting, transporting, and loading reels into racking when lifting the reel from the bottom is not possible. A fully loaded reel of electrical cable stored at ground level rarely provides the clearance a typical Reel Handler Attachment requires. In these situations, the Overhead Reel Lifter creates the opportunity to safely lift reels of up to 5,000 pounds from above. The ORL attaches securely to lift truck forks. A safety chain can attach to the mast or to a fork, adding another level of protection. Beams include keyhole chain-link slots for virtually instant adjustment when working with reels of different sizes. In between uses, store the ORL’s hooks and chains in an integrated storage tray. This fork attachment has a small footprint to conserve space when not in use, and it provides a vital service when you need to lift a reel that lacks ground clearance. Call our sales team at +1 314 423 2075 to learn more about the features and benefits of the BHS Overhead Reel Lifter. To browse through other reel-handling equipment from BHS, download the detailed PDF from the above link.